My biggest pet peeve ever! I want to share with you the number 1 thing that makes me cringe and sigh and have minor spats about to my friends. When someone hasn't pinned their wig to their head. 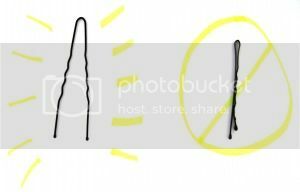 I reccomend using wide bobbypins to fasten your wig!! They will dig into your hair and you will go bald before someone pulls that wig off your head. I swear it to you. I have been wearing some seriously heavy wigs and I they haven't moved an inch when I used this technique! 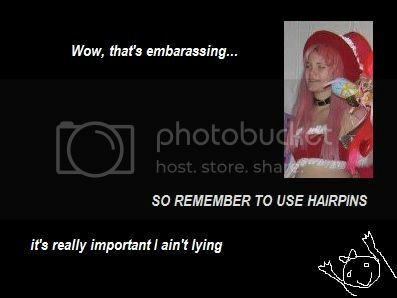 If you're wearing a wig that you haven't pinned properly, you're feeling it slowly slip off your forehead some crazy lady pops out of nowhere and offers to help. She murders your scalp with bobbypins - then it's me. Say hi pls. Aug 15, 2013 My biggest pet peeve ever! Nov 17, 2010 I. Can't. Believe. We. Won! Happy birthday and best wishes to both you and your lovely wife!